Mayor Steve Martin sees the potential for lifelong learning. Devonport Tasmania has launched a ‘Live & Learn’ Strategy to set a new direction for the city and establish a flourishing culture of lifelong learning. 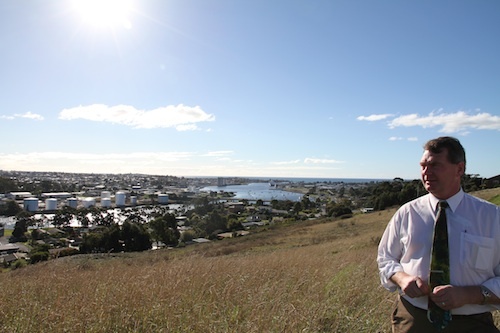 Devonport Mayor, Alderman Steve Martin left school at 16 then returned to study in 2011 aged 52 as a business student at University of Tasmania. Now Mayor Martin wants his whole city to get excited about learning. It was during his university studies as a mature aged student that he stumbled across the idea of learning communities. What if the Devonport region which has faced plenty of challenges – high unemployment, falling school retention and low levels of literacy and numeracy – adopted a whole of community approach to learning? Devonport Council brought together 150 representatives from education, community, industry, youth and government sectors to come up with a plan for how to lead, inspire and motivate the community to embrace lifelong learning. Mayor Martin said that everyone involved has become aware that there is a vast amount of educational opportunities –formal and informal – already available in the area. Making the community aware of the range of learning experiences going on in their city and viewing themselves as learners is an important part of the cultural shift, Mayor Martin says. For example, when people are given a demonstration and a chance to practise how to tune an engine at a local motor show, that activity should be recognised and valued as a successful learning opportunity. Organisations can benefit from partnerships with other community organisations as a great way of learning from each other. Local charities, for example, could collaborate with other charities share knowledge, skills and people. In response to poor school retention rates Mayor Martin is enthusiastic about the idea of a sports academy for young locals to offer training programs in sports event management, administration and coaching. Employment opportunities in Devonport are set to get a boost with a planned $250m Living City development in Devonport and the Australian Masters Games which the city will host in 2017. More information about Devonport’s ‘Live & Learn’ strategy.